In the Sri Chaitanya Charitamrita, Adi-lila, 1, 102, it is said that in the Mahabharata, Udyoga-parva, chapter 43, the five kinds of ignorance are described, I will try to explain them. 1- To believe that the body is the self. I, the soul, remember that when I was little in school some children wanted to hit me, I told my grandmother and she was talking to the school principal to defend me. The child body that I had has already changed, or in other words no longer exists. The self, the soul, remembers it because it is the same, never changes and is eternal. The first lesson one should learn in the spiritual life is to understand and accept that I am not the body. 2 – To make the material satisfaction of the senses the model of happiness. The most practical proof that happiness is not in sense gratification is that in rich countries like Denmark and Sweden and others are the countries with the highest suicide rates, one does not commit suicide because he is very happy, but because he is full of frustrations and sufferings. 3- Being in anxiety due to identification with the subject. We should not envy anyone, because envy is the cause of anxieties and fears. All relationships of materialistic people are based on envy, so they always live full of anxieties and fears. Materialists do not understand because the pure devotees of God or Krishna live happily without anxieties and without fears. 4- To lament. 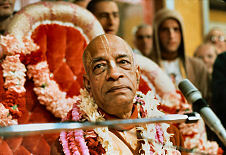 People complain about everything because they are not happy in God or Krishna consciousness. When a person is conscious of God, he lives with God and is happy and does not regret anything. He who is wise does not mourn for the living or for the dead. He who does good will never be overcome by evil. 5- To believe that there is something beyond the Absolute Truth. The Absolute Truth is the cause of all causes and He has no cause. There is only God or Krishna and His energies. When a person awakens his natural love for God, he will naturally love everything and everyone, since there is only God and His energies. There is the inconceivable unity and difference simultaneously. From time immemorial the greatest problem of people is that they are attached to ignorance. When they know someone who is full of knowledge, bliss and eternity, instead of rejoicing, they envy him. I was born in the darkest ignorance, and my spiritual master opened my eyes with the torch of knowledge. 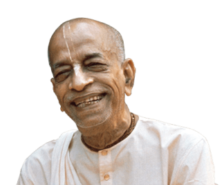 I offer my most respectful obeisances unto my spiritual master, Srila Prabhupada..